Roughly 15% of the world’s population has some form of disability. That’s over 1 billion people. And that means it’s critical for brands to create experiences and products with accessibility in mind. 5th June 2018 saw the release of the Web Content Accessibility Guidelines (WCAG) 2.1. The extensive set of recommendations known WCAG enables web designers, developers and programmers, to ensure that digital technology, such as a website, electronic document or software app, is fully accessible to people with disabilities. WCAG is an essential resource for anyone striving to ensure that their website, downloadable app, internal office programs, PDF files and so on can be used easily by all individuals, regardless of disability. Each of the guidelines in WCAG has measurable success criteria divided into the levels of A (lowest), AA and AAA (highest). More A’s equals more demands, but better accessibility when met. (see Understanding the Four Principles of Accessibility for the WCAG definitions). Users of mobile devices. Mobile technology has dramatically changed the way we go online. Today we’re using a broader range of devices than ever before, including smartphones and tablets, TVs, wearable technology (e.g. smartwatches) and devices in our cars. Compared to traditional desktop computers and laptops, these devices are more likely to have smaller screens and touchscreens and may be used in a wider variety of settings, such as bright sunlight. Users with low vision (i.e. vision disabilities other than blindness). Issues like light sensitivity, contrast sensitivity, colourblindness, restricted field of vision and visual distortion can have an impact on accessibility needs. WCAG 2.1 provides technical solutions to meet these needs. Users with cognitive disabilities. Intellectual disabilities, learning disabilities, attention deficit disorder, autism and age-related cognitive decline can all affect the way a person uses digital technology. 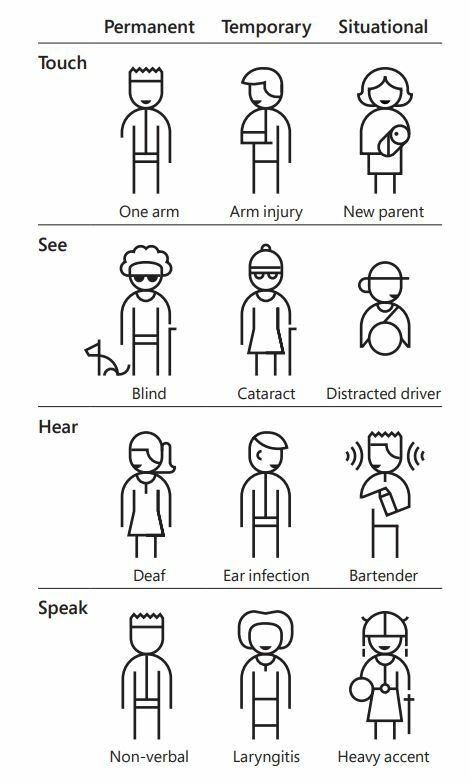 WCAG 2.1 is designed to improve accessibility for these groups. How to Meet WCAG 2.1 – A customizable quick reference to WCAG 2.1 that includes all of the guidelines, success criteria, and techniques for authors to use as they are developing and evaluating Web content. This includes content from WCAG 2.0 and WCAG 2.1 and can be filtered in many ways to help authors focus on relevant content. Understanding WCAG 2.1 – A guide to understanding and implementing WCAG 2.1. There is a short “Understanding” document for each guideline and success criterion in WCAG 2.1 as well as key topics. Techniques for WCAG 2.1 – A collection of techniques and common failures, each in a separate document that includes a description, examples, code and tests. The WCAG Documents – A diagram and description of how the technical documents are related and linked. Should I be doing anything? The European Union (EU) Directive on the Accessibility of Websites and Mobile Applications requires EU member states to make sure their websites and mobile apps meet common accessibility standards. The Directive will be transposed into the laws of each EU member state by September 23 2018. If your service isn’t accessible to anyone who needs it, you may be in breach of the Equality Act 2010. You’ll also need to test your service with users who have disabilities and with older users. The best way to meet these criteria is to think about accessibility from the start, run your own accessibility tests regularly throughout the development and get a formal accessibility audit before you go into public beta. If you’re looking to achieve official conformance for Level A, AA or AAA accessibility, we work with 3rd party auditors that carry out the checks. We can provide an initial audit, however, to ensure that your site is ready, and can work with you to get your website in shape before it’s submitted for auditing.